I'm ashamed to say it took us a year and a half of living in the bay area before we went to Yosemite for the first time. I'd been before many years ago in winter on a bus tour, which just made me mad that I had so little time. I've wanted to come back ever since. 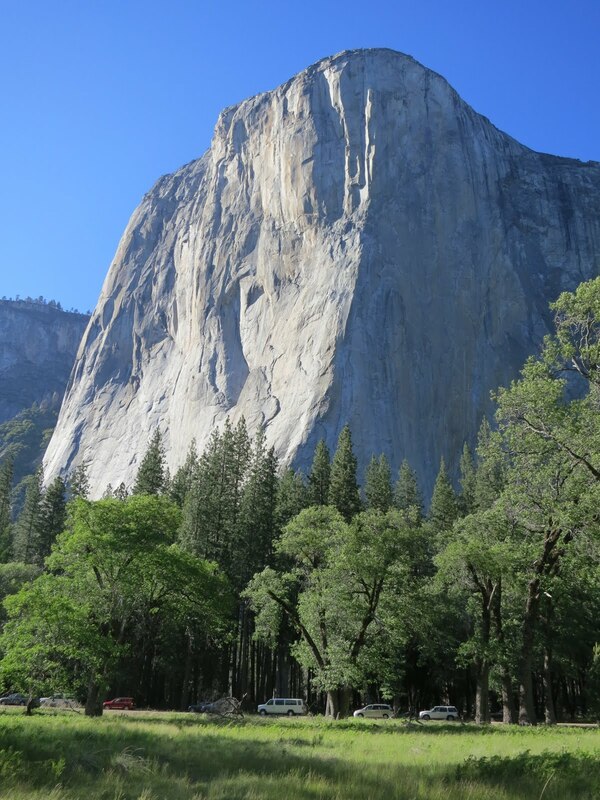 Our friends Mary and John were just about the best tour guides you could hope for - experienced Yosemite climbers who have lived (as staff for some time) and played in the park for years. First order of business, get on some rock. 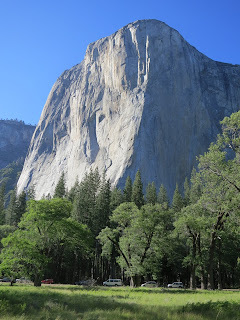 We headed to sunny side bench, just around the corner from Yosemite falls, fearful of the crowds on the 'fee free day'. But there were surprisingly few climbers around and we hopped onto the popular Jamcrack (5.7, 5.9) pretty much straight away. 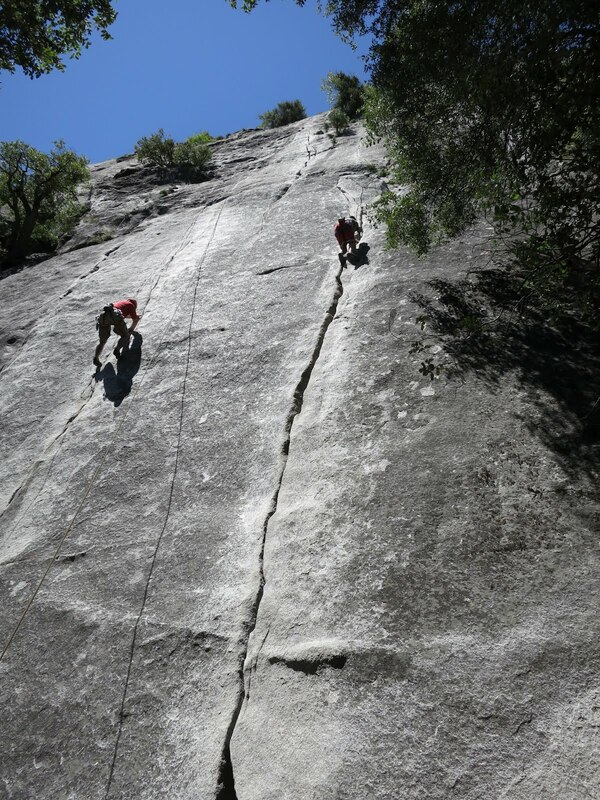 I'd injured my shoulder the week before so I was happy that I could get on the rock at all. With the help of some ibuprofen I jammed up the nicely smoothed crack and had a fun time topping Bummer (5.10d), but the injury, and a month in spain before that, meant no gym training so I was spent pretty quickly. Ella hung out with her buddy Lily at the bottom of the climb, sleeping and crawling in the dirt and eating pinecones. We stayed in a beautiful house on the Tulomne river, with two other couples. Great place to stay although still about an hour's drive to Yosemite village on the valley floor. On the second day Em and I hiked with an 18 lb (8.2 kg) Ella from Porcupine Creek to the top of North Dome (9.2 miles, 14.8 km). You do most of the climbing in the car but there is still an elevation change of 3900 ft (1.2 km) on the round trip. Most of the distance is in undulating pine forest, but towards the end it opens up for spectacular views of the valley. In one direction you have half dome and cloud's rest. In the other you can see the sentinel, cathedral rock, and the nose of el cap. It's hard to convey the immensity of that view. I think this hike beats Angel's Landing, making it my new favourite day hike in the US.